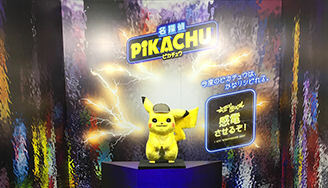 From April to May 2019 a special tour will be going around Japan called the "Pikachu Kanden Studio" (or "Pikachu Electrocution Studio") during which fans will get the chance to take social media-friendly pictures inspired by the movie Detective Pikachu! Will you let Pikachu shock you? Below are translations of the promotional material for the event posted on the official website. 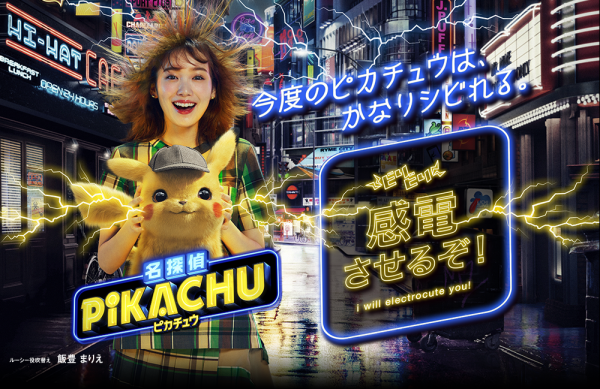 With the "Pikachu Kanden Studio" you'll be able to take pictures that make it look like you're being electrocuted by Pikachu! But that's not all! You'll also be able to see what it's like to be in the world of the movie Detective Pikachu! There will be three different photo spots set up at this free event: the Pachi-Pachi Booth, the Mofu-Mofu Booth, and the Gira-Gira Booth. The Pachi-Pachi Booth ("Crackling Electricity Booth") uses a Van de Graaff generator to produce static electricity so you can take a photo with your hair standing straight up as if you're being electrocuted by Pikachu! 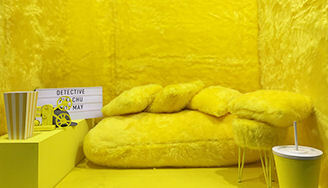 The entirety of the Mofu-Mofu Booth ("Fluffy Booth") is the same yellow color as Pikachu's fur. The super comfy sofa and other furniture is made of soft, fluffy materials that feel great to the touch! You can take a picture with Pikachu and get a real cuteness overload! 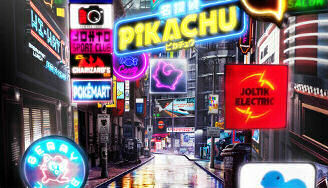 The Gira-Gira Booth ("Dazzling Booth") recreates Ryme City, the setting of the movie where people and pokemon live together. Neon signs just like the ones that appear in the actual movie footage have been set up so you can get your picture taken inside Ryme City! 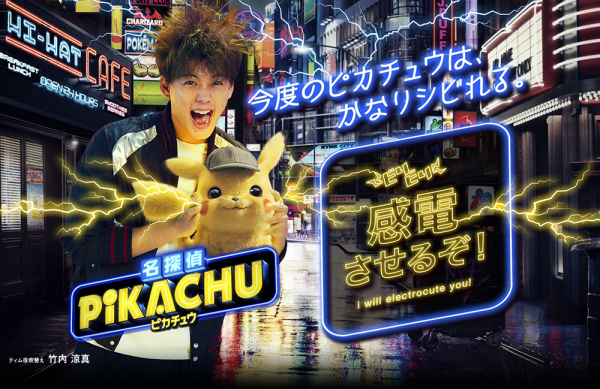 Take a photo at the event space and post it on sites like Twitter or Instagram using the hashtags #名探偵ピカチュウ ("Detective Pikachu") or #感電 ("electrocute")! If you show your social media post to the staff on-site you'll be given a special commemorative movie sticker! Imporant: Please note that the following are translations of warnings posted on the official website and is for informational purposes only. Dogasu's Backpack is not liable for any harm, medical or otherwise, caused by participating in this event. Those under 10 years old cannot participate. If elementary school children (10 to 12 year old) want to join they'll need a letter of consent from their parents or guardians. Numbered tickets will be handed out at 11:00, 13:00, and 15:00. ※There's a limit to the number of tickets that will be available and so there's a chance you won't be able to experience this attraction when you come. We appreciate your understanding. Participants will be asked to remove any jewelry, watches, smartphones, or any other metal objects. We ask that those with pacemakers please refrain from joining this activity. We ask that those with bolts or any other pieces of metal inside their bodies due to surgery, etc. to please refrain from joining this activity. Certain hair products, especially those with anti-static ingredients that cannot be washed out, for example, may hinder the production of static electricity. Therefore, it's possible the proper amount of static cannot be produced to give these participants the full experience. That static electricity will increase your blood circulation after you leave. Everyone will react differently but your body's attempt to mitigate this sudden increase in blood flow may cause you to experience symptoms of dizziness, sleepiness, or sluggishness. The devices that produce the static electricity will be tested thoroughly beforehand but since static is a phenomenon that can be easily affected by things like the weather, humidity, and temperature it's possible that everything might not work as intended. We appreciate your understanding.